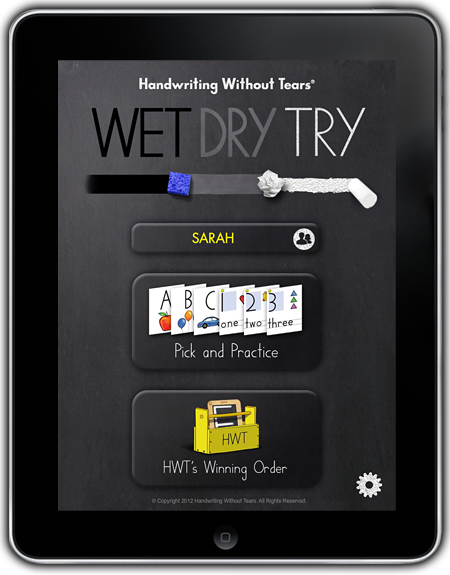 Handwriting without Tears has developed a new app, for seven inch or larger android or ipad devices called Wet, Dry, Try. As part of the TOS Review Crew I was able to review this app with my seven year old son. This product is geared for 4 to 8 year olds. 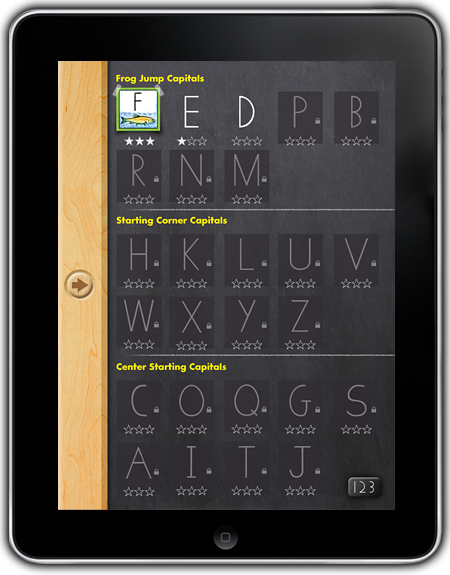 It is like the popular slate chalkboard that is the well-known part of the Handwriting Without Tears program. The name of this app is Wet, Dry, Try. It is available for purchase for Android or Ipad devices for $4.99. It is meant for tablets with a 7 inch screen or larger. 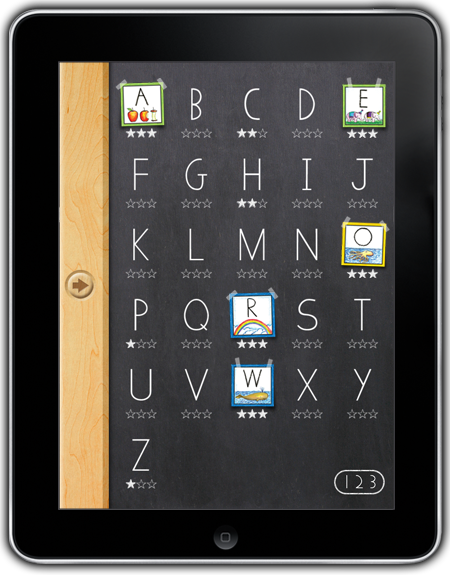 The Wet-Dry-Try App is designed to act as a virtual chalkboard, allowing your child to work on writing their letters anywhere you want to learn! There are two ways to work with the program: Pick and Practice or HWT's Winning Order. This screen shot is of their Pick and Practice screen. The child can pick whatever letter they want, in whatever order they want, to practice writing their letters. This was my son's preference. He went through this fairly quickly indeed, and did not have to be asked to do it.. This is the screen shot of their Winning Order. In this version you must complete each letter in the order that it is posted. We learned that you don't have to go through all three levels to be able to move on to the next letter, but you have to at least practice it once. My son had a STRONG dislike for a forced order of practice, and therefore very much took his time doing this version. You press on the letter to be done. It comes up with a picture matching the letter, for instance R has a rainbow. You need to earn three stars to earn a letter card. Each star is progressively more difficult to earn. First the program shows you how to draw the letter, then you sponge off the letter, dry off the letter and then write it yourself. It allows three mistakes before it shows you how to correct your error. Lines need to be drawn in one smooth motion with no significant deviations. The instructions are very clear. The audio is encouraging to children. I like silence with my apps so beyond asking the lad what he thought of the noise/audio I tended to turn that aspect off. The device I used this on: My device is a 9.7 inch N90 Dual Core 2 Tablet. 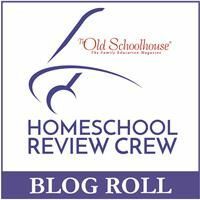 I chose to review this product for two reasons. 1. My son is particular in how he does things and once a method of doing something is chosen DISLIKES very much changing it. In his writing he does not write in the most efficient manner, but simply in the manner that he decided was best. I wanted a product that would force him to think about how he was writing. 2. I wanted him to have to complete a project that was particular about how it got accomplished. I did NOT get it to teach him his letters. He knows his letters and he knows how to write them. Just the way he wrote them was a concern for me. Did this program accomplish the objective I wanted from it? It challenged him on letter formation, and one time he said "Mom, they way they make me do this letter (I can't recall right now which letter it was) is easier Mom. I think I'm going to do it like that from now on." And he does. The pick and practice also forced him to slow down at times. Going slowly forces a body to think. We found that it worked best on a surface with a wee bit of give to it (like the couch). It did NOT work well in a vehicle. My son's opinion of the app in general: "I thought it was pretty good". My husband as he looked on at my son working on this app commented once, "How is this going to actually help him write the letters? One doesn't write letters using their index finger". I would LOVE to see lowercase letters as an option once all the upper case letters were completed. I received a free copy of this product through the Schoolhouse Review Crew in exchange for my honest review. I was not required to write a positive review nor was I compensated in any other way. All opinions I have expressed are my own or those of my family. I am disclosing this in accordance with the FTC Regulations.